When you look for a hotel room, you usually choose what to book based on how many beds you need, the size of the space, and the amenities offered (like a minibar or room service). Rarely do you get a room that’s completely different than anyone else’s. But the Volkshotel in Amsterdam has a unique setup. 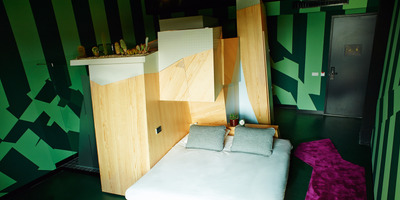 Guests can book a one-of-a-kind room specially designed by local architects and interior designers. Though the hotel offers regular rooms as well, nine rooms showcase winning designs from a site-specific competition. 40 designers pitched their concepts for unique hotel rooms to Volkshotel in 2014, and the hotel then selected the ones that would actually be implemented. Some look more cinematic, while others seem filled with German Expressionist set pieces. Take a look at the unique rooms the hotel offers. 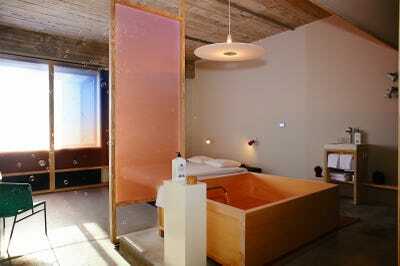 A room called the Bathing Bikou, made by designer Hanna Maring, centres around the concept of bathing. The wood-enclosed bathtub is placed front and center. A wood-slatted bench and a lounge chair near tub make the bedroom feel like a spa. The Cabin in the Woods, created by designer Gabor Disberg, features a suspended bed platform encased in a partially deconstructed cabin-like enclosure. True to its name, it has a woodsy feel, which is accentuated by a birch pole near the bed and a hammock and fur throws next to the cabin. The dark and edgy Cinema Boudoir, designed by local curator Maja Markovic, was inspired by the Electric Cinema, a movie theatre in London. A built-in projector allows you to enjoy a film from the king-sized bed or the bathtub behind it. 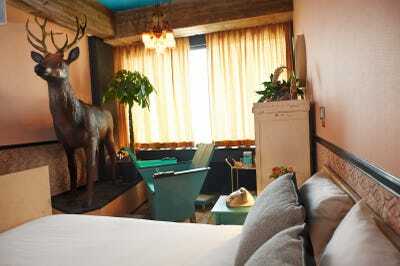 Danny the Deer is Volkshotel's most compact special room. 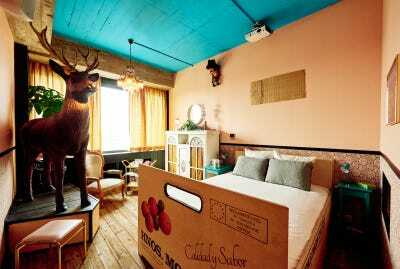 It features the eponymous deer statue and a bed frame that looks like an oversized orange crate. The room was designed by Eva van Halewijn, who's actually the restroom attendant for the hotel's restaurant and event space, the Canvas. This was the first room she'd ever designed for a hotel. 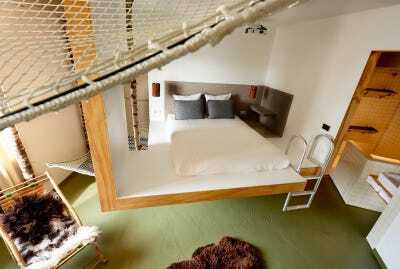 ... is a lofted bathtub, high up from the floor. You have to climb a staircase behind the tub to get in. In Johnny Jukebox, architect Remco Gonggrijp integrated a speaker system straight into the ceiling. 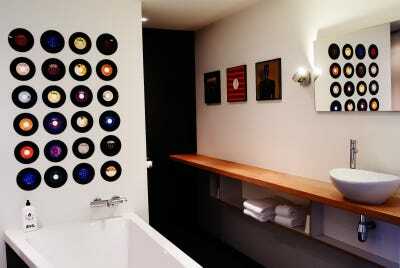 In addition to playing music from their personal devices, guests can take advantage of a collection of vinyl records, cassettes, and CDs that comes with the room. Soixante Neuf, created by designer Rosa Lisa Winkel, features a minimal, sleek design. 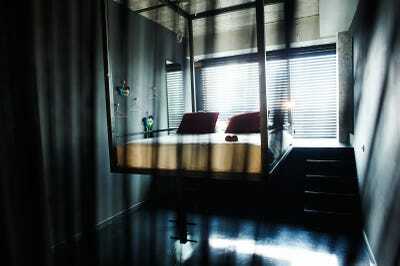 The bed is suspended on a metal frame, and the window boasts a grand view of the Amsterdam skyline. 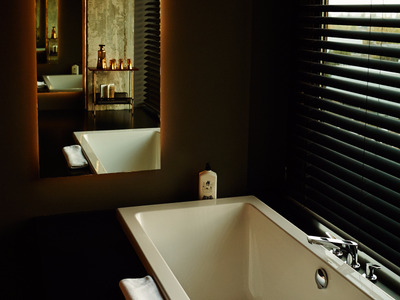 In the bathroom, a small tub is sandwiched by a pair of opposite-facing mirrors that infinitely reflect each other. 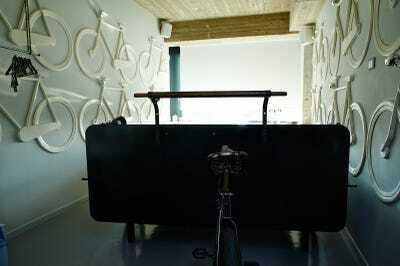 The White Bike Room, designed by architect Thijs van Oostveen, features bike parts in almost every part of its design. That's perfect for a city that has more bikes than people. 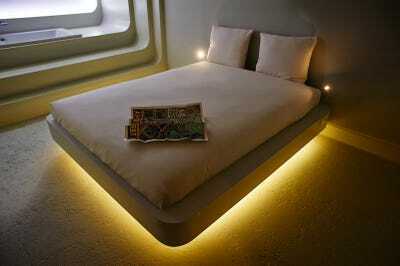 Even the bed is on wheels. 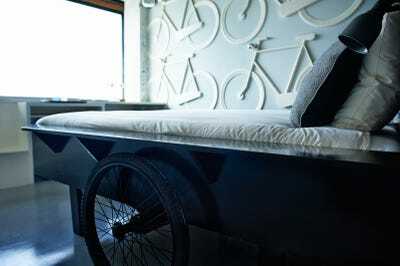 Some of the wall bikes also have lamps attached -- you can turn them on to read in bed. You Are Here, by designers Linde Ex, Swaantje Nijkamp, and Ella Gil, is perhaps one of the most striking rooms in the Volkshotel. And that's not just because of the bathtub that's seamlessly positioned next to the window. Many parts of the room light up. You can even pull down the shades and have them backlit. The room also has a mounted map display on the wall. When you press a point on the map, footage from that place gets projected onto the walls. 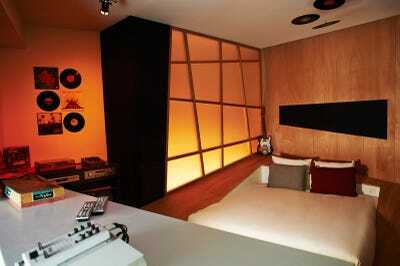 Or you can just use the projections to turn the space into a neon, 80s-inspired bedroom like you see here.